We at CraneVeyor service and maintain all brands of overhead crane and hoists not just CraneVeyor built equipment. We are a warranty/service center for CraneMart, Yale, Shawbox, Ingersoll-Rand, Gardner Denver and other manufacturers, and our service personnel have extensive factory training and experience. Please review the information links below for more information about our capabilities. Repair Capability - CraneVeyor service technicians are dispatched in well-equipped trucks with the tools and common parts for most repairs. Our plant has one of the largest inventories of repair parts and components in the country and the capability to provide in-house machining and fabrication for repairs and replacement components. Certifications & OSHA Compliance - All cranes must be inspected and load tested when installed and after major modifications. 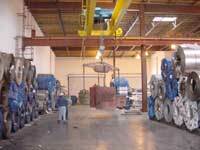 The inspection requires certification by the inspector that the system complies with OSHA standards. In California and other jurisdictions a yearly certification by a licensed surveyor is required for cranes over 3 tons capacity. 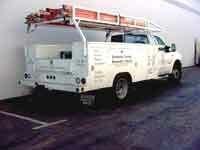 CraneVeyor provides these services with licensed surveyors (CalOSHA Certification No.CA-303). Load Testing - CraneVeyor provides load testing for new crane installations and for the periodic re-testing required for cranes over 3 tons capacity and after major modifications. The tests are at 125% of the rated load. We have in house weights for up to 25-ton cranes, with availability to provide solid or water weights for the larger cranes. 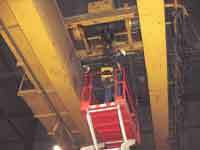 Inspections and Preventative Maintenance - OSHA requires periodic crane inspections, including daily visual and at least quarterly documented inspections. CraneVeyor can work with you to setup custom tailored maintenance programs using our CPS® computer software, which provides detailed analysis, and reporting of the condition of your cranes. The reports allow monitoring and preventive maintenance of your cranes and reduction of costly production loss. 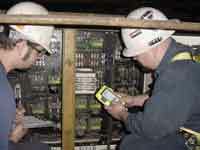 Training - CraneVeyor provides crane operator and maintenance training. After successfully completing the crane operator classroom and practical training the operator can be provided an operator card. The training program for your maintenance personnel can be designed around the equipment and requirements of the crane equipment you have and not just a general overview.